Don’t you just love summer! This summer has been so mild (knock on a vintage wooden bread board) that it has me thinking of fall earlier than usual though. No, I’m not going to get all cornstalks, cider and pumpkins on you. Yet. But I did have to force myself to not put a bowl of apples and a mum on my kitchen table. For right now, I’ll try to savor the last bit of summer. The sailboat in the photos is the one I made from tree branches and some vintage ticking fabric a few years ago. You can find the super simple tutorial here. And the equally easy thermos lamp tutorial can be found here. And just about anything else you see in this photo can be found here on my blog somewhere. It’s almost all thrifted stuff except for my mom’s kitchen table and the black chairs. Has your mind started wandering to fall yet? Or are you fully immersed in summer? Cute vignette, and I love the little sailboat. Of course, the sunflowers are fabulous!! this is So wonderful! i am going to make a sailboat for myself, thanx for the info. 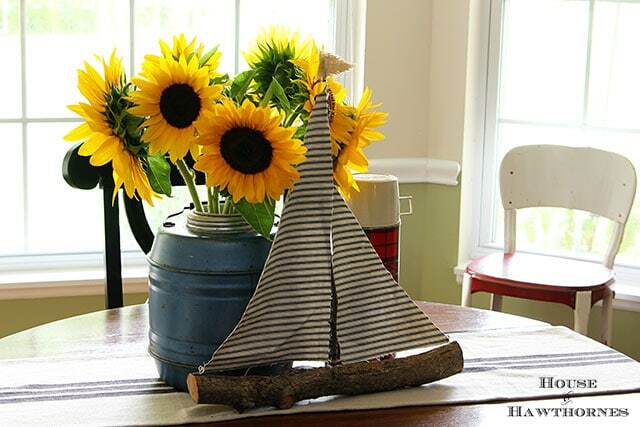 Love the sunflowers and sailboat. perfect for this time of year. I’m craving pumpkins and mums here too. I have just loved this summer of fun, so I’m not ready for fall yet…but I do see the apples on my trees telling me it’s coming soon! Does not get much happier than that Pam! 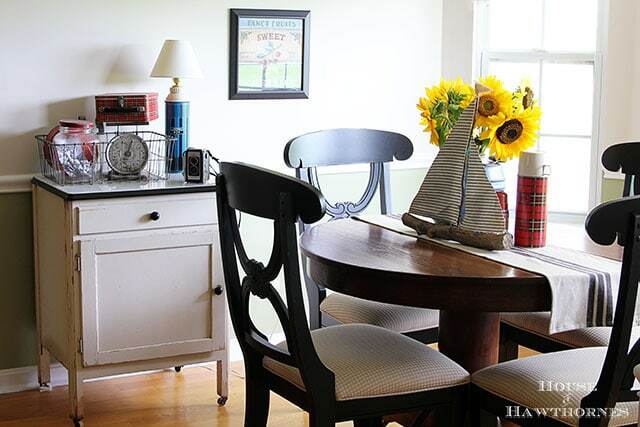 Love the vignette with the sailboat, it’s adorable! 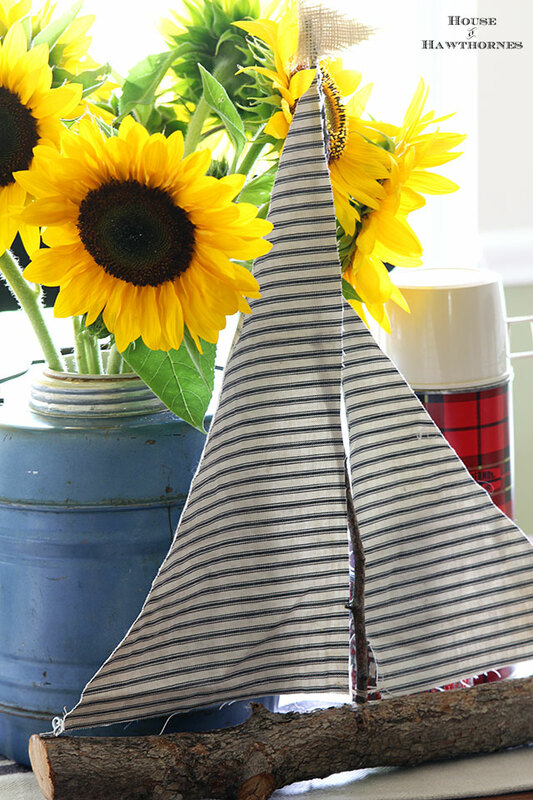 Your sailboat is so cute and I love sunflowers. Beautiful photos! Please…no Fall yet! Summer just doesn’t last long enough. Love the little sailboat! The thermos lamp and everything else on the little table is just perfect! I’m pretty good about keeping Summer minded right now. Then I get on Pinterest. And I start pinning Fall things like a madwoman. With our recent acquisition of our lake house, I’m totally not wanting summer to end…EVER! Kinda hard to avoid and I need Chris back to school so we can afford the a-frame cottage. I loved your sailboat last year and I’m really loving it even more this year. 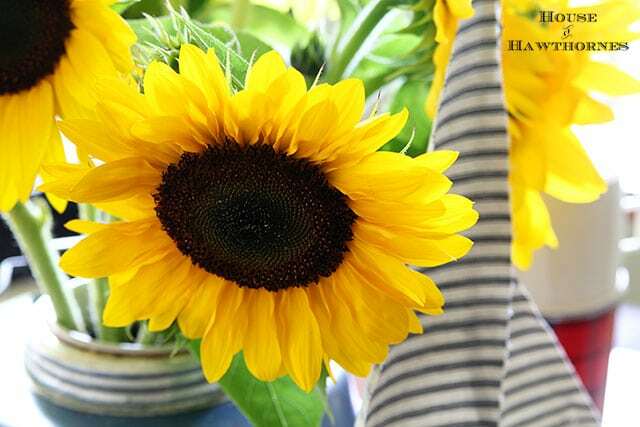 Now, I need a bouquet of sunflowers. I don’t even want to think of fall yet, I want summer to stick around! Pam, This is so cool and unique! I love it! Pinning and sharing! I’m so in love with that sailboat! Pinned!! It surely has been veering to fall! Been looking on Pinterest for inspiration. Hot as Hades here. What a pretty tablescape you’ve created, Pam! And yes, it feels more like September than the beginning of August, so I’m thinking fall already. 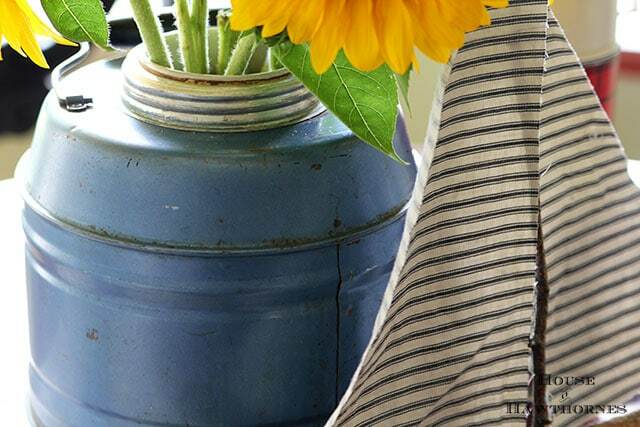 I love the sailboat, and your thermos lamp looks adorable on your little cupboard! That sailboat is adorable Pam! I have the perfect spot in my store for a Fall display but I must resist for a few more weeks! I keep telling myself just enjoy Summer, it will be gone before we know it!